Sweet Coleslaw with Pineapple ? Yes, you are reading this right, Coleslaw with Pineapple, trust me, it’s really good. This unusual sweet coleslaw, with pineapple and cilantro is the perfect side dish for Spring and Summer. Crunchy cabbage and carrots, combine with sweet bursts of flavour from pineapple, and citrus from the cilantro. It’s also prepaheadable, inexpensive, great for a crowd and delicious. Excellent at any Pot luck or BBQ, as a side for grilled dishes, and my favourite, served on top of Pineapple Pulled Pork Sandwiches This is the ultimate in messy, juicy goodness. 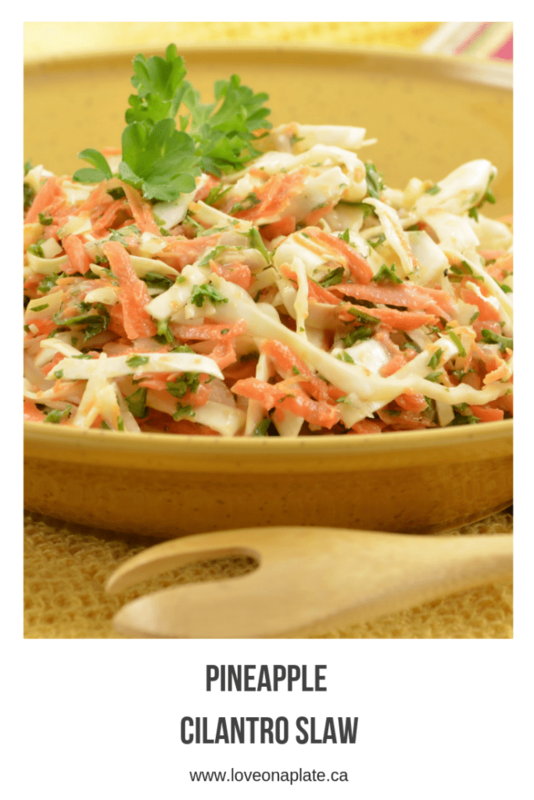 If this Sweet Pineapple Coleslaw isn’t quite what you are looking for, not to worry! I have a solution. Try my Sweet & Spicy Slaw, it’s vinegar based with no pineapple and a little hint of heat. Also really good on top of Pulled Pork Sandwicheswhere you are looking for a little less sweet and a little more heat. In a large mixing bowl combine Mayonnaise, sugar, apple cider vinegar, coleslaw mix, drained pineapple tidbits (reserve the juice), red onion and cilantro. Mix well. Add 1-2 Tbsp reserved pineapple juice, salt and pepper. Taste and adjust seasoning as needed. In a small bowl with a lid mix together all ingredients except coleslaw mix. Stir to combine. 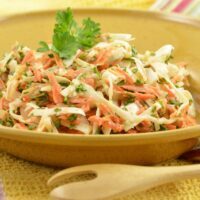 On cooking day combine coleslaw and dressing. Mix well. Let side at least 10 minutes before eating to allow flavours to meld. Watch me prepare Pineapple Cilantro Coleslaw and Pineapple Pulled Pork LIVE. You’ll see how simple it is!